Ever wonder whether that shelf will sag? How about scratched your head over compound angles or how to calculate the staves in a coopered barrel or segmented bowl? Well, you’re not alone. 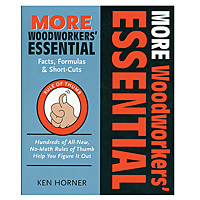 That’s why Ken Horner has created this invaluable reference, complete with simple, clear explanations for the most confounding problems in woodworking. From practical problems like figuring your setup for cove molding on the table saw, to “out of this world” science stuff like removing rust from tools with electrolysis, it’s packed with fun facts that make it hard to put this volume down. Includes no-math shortcuts, as well as mathematical formulas for those who prefer the calculator. 344 pages. Softcover. This entry was posted in Book Reviews, New Products and tagged Book, Formulas and Shortcuts, More Woodworkers' Essential Facts by bdks. Bookmark the permalink.